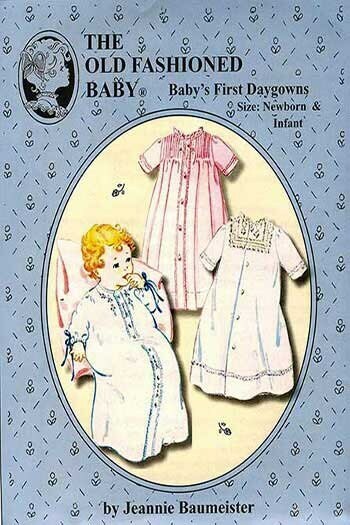 Baby's First Daygowns Pattern is a "must have" pattern. This pattern is so sweet and so easy to make that it will become your standard Baby Gift Pattern. There are three syles, One with a plain front and sweet embroidery, A Tucks and Lace (lace is optional) version and a Fancy Lace Yoke style. There is a choice of three different sleeves which can be used in any view. Two sleeve versions are cuffed, one is long sleeves and the other is 3/4 length. And the third sleeve has a casing for a ribbon to draw it up. 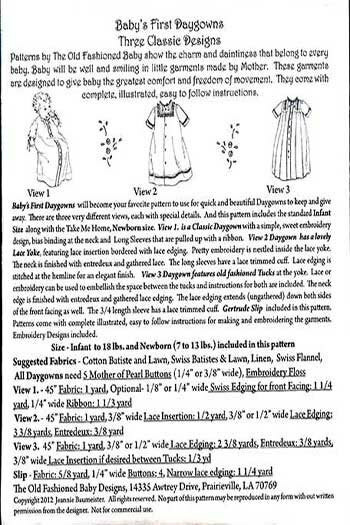 This pattern includes both Newborn (Take Me Home) and Infant sizes.